This week, the SigEp Patriots Project (SPP) honors and remembers 16 brother warriors from as many chapters and every branch of the military, including one from Wyoming Alpha who made the ultimate sacrifice more than 71 years ago while taking part in the liberation of Sicily during WWII. SPP pledges it will always remember all our brothers who serve/served our great country, and hopes you will celebrate with us by reading and passing word of this post. On this date, North Carolina Epsilon Brother Robert L. Orr entered the U.S. Army, and went on to serve in the Army Corps of Engineers during World War II. Massachusetts Alpha Brother David H. Johnson joined the U.S. Coast Guard on this date, serving as a Soundman Second Class during World War II. 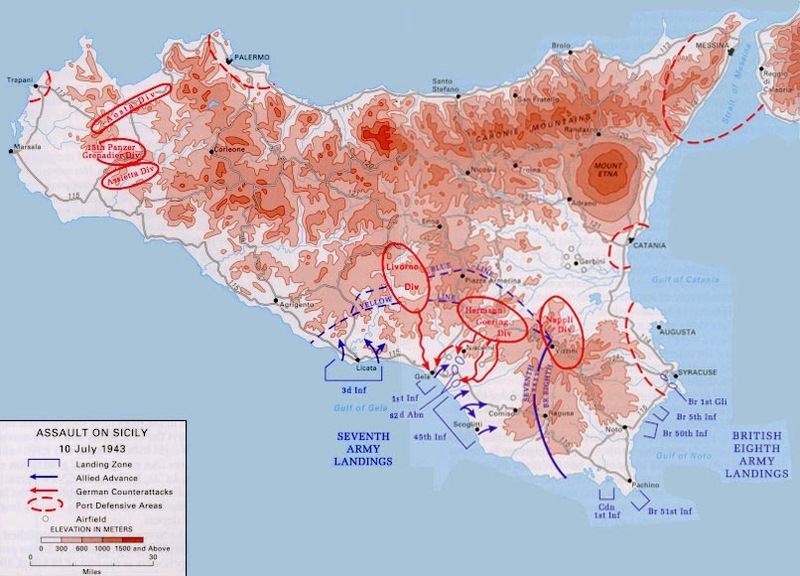 A year ago, SPP mentioned in this work that 10 JUL 1943 marked the beginning of Operation Husky - at the time, the largest combined operation of WWII, and asked if anyone had any idea how many SigEp Patriots where there. Now we know that at least one brave SigEp made the ultimate sacrifice on the second day of the operation. On this date, World War II Veteran and Wyoming Alpha Brother First Lieutenant Paul C. Rawdon, Jr., U.S. Army was 26 years old, and assigned to the 179th Infantry Regiment, 45th Infantry Division when his unit made landfall on the southern shore of Sicily. Paul completed his bachelor's degree at the University of Wyoming before going to work in New Mexico. He was inducted in to the Army in MAR 1941, and he was with the division when it shipped overseas a month before he was killed. Respect can be paid to Brother Rawdon at Block 12, Row C, Plot 13 of Glenrock Cemetery, Glenrock, WY. World War II Veteran and Alabama Beta Brother First Lieutenant James Calabra, Jr., U.S. Army was discharged from the service on this date after nearly three years of duty, including 17 months in the China-Burma-India Theater with the 3286th Engineers. On this date, World War II Veteran, SigEp Citation Recipient and Virginia Zeta Brother General Robert J. Wood, U.S. Army (Retired) died of a stroke at the Veterans Administration Hospital in Washington, DC. As a general, Brother Wood wore four-stars, and the SPP archives indicate that he is one of only seven SigEp Patriots known to have reached the highest officer rank in any branch of the U.S. military. He retired after 36 years of service to the nation. Robert was instrumental in the creation of Supreme Headquarters Allied Powers Europe (SHAPE) – NATO’s European military organization, and served as director of the U.S. military assistance program from 1962 to 1965. Brother Wood attended Randolph-Macon College for a year before entering the United States Military Academy in 1926. In 1930, Robert graduated from West Point, and was commissioned a Second Lieutenant, U.S. Army Coast Artillery Corps. During World War II, he served in the Mediterranean Theater, advancing from Captain to Colonel. Following the war, Brother Wood served as a military aide to Secretary of Defense and NH Alpha Brother James Forrestal. Following his work at SHAPE, Robert was promoted to brigadier general, and assigned as Chief of the Defense Annual Review Team for the U.S. Mission to NATO. In 1956, Brother Wood became commanding general of Fort Bliss, and commandant of the Antiaircraft Artillery and Guided Missile School located there. With his promotion to Lieutenant General in 1960, he was assigned as Commanding General of the Army Air Defense Command, and two years later appointed director of the military assistance program in the office of the Assistant Secretary of Defense for International Security Affairs, with the rank of full general. 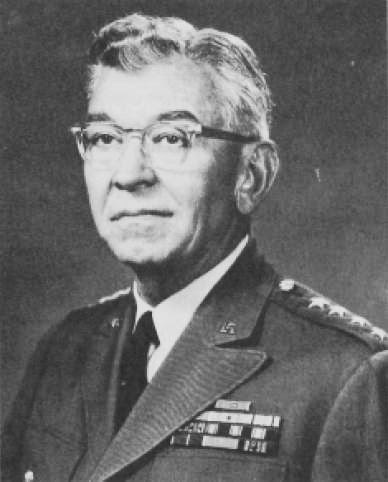 As Director, Brother Wood was considered to be on the same level as the chiefs of staff of the Army, Navy, and Air Force – the senior leaders of each branch. Robert retired in 1965, but was recalled to active duty in 1968 to serve as Director of the Overseas Base Requirements Study Group. He returned to retired status in 1969, and subsequently served on a presidential task force on international development. Respect can be paid to Brother Wood at the U.S. Military Academy Post Cemetery, West Point, NY. U.S Army National Guard (Montana) Veteran Montana Beta Brother Daniel W. Ayres died on this date at his home in Cody, Montana. Born and raised in Montana, Daniel attended Montana State University, Bozeman, and the University of Montana in Missoula. Brother Ayres was an active Gideon, a certified swimming and sailing instructor and a 4-H leader. He was also a sandblast artist in the Bozeman Granite Works – a family-owned business, and worked as a dairy-route driver, proprietor of Rainbow Water Service, a real estate broker, and a charter tour bus driver. Respect can be paid to Brother Ayres at Plot 16 of Riverside Cemetery, Cody, WY. On this date, World War II, Korean War & Vietnam War Veteran, Virginia Eta Brother Commander Donald E. Cummings, U.S. Navy (Retired) died in The Woodlands, Texas. Brother Cummings served in the U.S. Navy from 1946 to 1969 as a fighter pilot. While in the service, he boxed in the finals of the Olympic trials. His last assignment was as Air Boss on the aircraft carrier USS Shangri-la (CV-38) serving with the Atlantic Fleet. While at the University of Virginia, Donald was a member of the championship boxing team. After retiring from the Navy, he became the corporate pilot for Campbell-Ewald Advertising Corp.
Born and raised in Bristol, Virginia, U.S. Marine Corps Veteran Missouri Epsilon Brother King A. Hagey III, 71, died there on this date. After graduating from high school, King served in the Corps from 1958 to 1959 before attending Culver-Stockton College. After earning his Master of Arts in biology, he worked in medical research at the Veterans Administration Medical Center in Nashville, and retired after 30 years of service. When he retired, he returned to Bristol to live and care for his father. He was a member of Chapter 39 of Disabled American Veterans. U.S. Army Veteran Arizona Beta Brother Eric W. Fields, 62, died on this date. After earning his bachelor’s degree from University of Arizona, Brother Fields received a master’s degree from The University of Missouri, and subsequently taught at several universities. Eric was involved in numerous ministry positions, including board director for the Emporia Kansas Salvation Army. For 16 years, he was a devoted field account manager with Spring Arbor Distributors. On this date, Tennessee Alpha Brother First Lieutenant Thomas J. Williams, Jr., U.S. Army National Guard (Tennessee), 26, died when the OH-58D Kiowa he was piloting crashed near Caryville, Tennessee during a training flight. He was assigned to Troop C, 230th Air Cavalry Squadron. Thomas joined TN Alpha during his freshman year at UT, and was also a member of the University of Tennessee ROTC program. 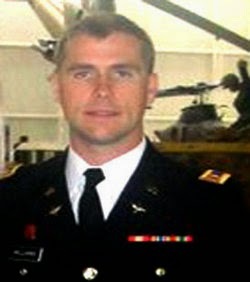 He returned to the UT Army ROTC program in 2011 as an assistant professor of Military Science. In addition to his military service, Brother Williams was owner and president of Southeast Investment Group, specializing in real estate sales and investments as well as construction and project management. The family ask that donations of remembrance be made to The 1LT Thomas Williams, Jr. Memorial Fund at CedarStone Bank, P.O. Box 724, Lebanon TN, 37088. On the same date, World War II Veteran and Michigan Alpha Brother Major Robert J. Ogden, U.S. Army died of pneumonia in Lakeland, Florida. He was 91 years old. During WWII, Robert was stationed in the Aleutian Islands with the Army Corps of Engineers. He retired as a sales engineer for Alcoa after 32 years. Ohio Gamma Brother Randal Dudis was commissioned a Second Lieutenant, U.S. Army Reserve (Medical Services Corps) on this date. Vietnam War Veteran and Vermont Gamma Brother Captain Charles V. Masick, U.S. Army, 69, died on this date in Cooperstown, New York. In addition to SigEp, Charles was in the ROTC program at the University of Vermont, and was commissioned a Second Lieutenant, U.S. Army upon graduation. Charles was a helicopter pilot with the 1st Air Cavalry Division, and his awards include the Bronze Star, Purple Heart and Air Medal. Respect can be paid to Brother Masick at Section 6, Site 1308, Gerald B.H. Solomon Saratoga National Cemetery in Schuylerville, NY. Vietnam War Veteran and Georgia Epsilon Founding Father First Lieutenant Herbert A. “Andy” Wall, Jr., U.S. Air Force, 66, died on this date after a courageous battle with Lou Gehrig's disease (ALS). Andy received his bachelor's and master's degrees from Georgia Southern University, and taught social studies and German language in the Bulloch County School System. He retired from teaching in 2004. Memorial contributions may be made to Ogeechee Area Hospice, P.O. Box 531, Statesboro, Ga. 30459. On this date, Ohio Iota Brother Mike Callas was commissioned a Second Lieutenant, U.S. Army. ** Operation Iraqi Freedom Veteran and KY Eta Brother Private First Class Jon Rourk, U.S. Army and his girlfriend, Leigh Ann, are expecting their first child – a girl named Addyson Elizabeth – around December 6th. Congratulations to both of you and your families! ** Virginia Beta Brother David Costello was commissioned a Second Lieutenant, U.S. Army on Friday! David’s branch is Aviation, and the Army will be sending him to Fort Rucker for his training. Best of luck, Brother Costello!